The sheets are cold with your absence as I crawl out from underneath them. The clock ticks 1:48AM. Sleep eludes me tonight. Pacing the ground purposefully, my bare feet are restless on the asphalt, toes twitching, itching, as though determined to close our distance, whether of a few inches or a hundred miles. Trees sway in the breeze, the rustling leaves playing a melody to which we shared a dance. With shaking fingers, I clumsily light a stale cigarette I found in my pocket. Every drag, every smoky breath I exhale, is a sigh of longing. With stinging eyes, I watch the gray smoke dissolve, soft and quiet, into the night. My vision blurs. I shrink under the vastness of the night sky, forgetting that we exist under the same moon. I shrink beneath the canopies of constellations, forgetting that the stars we gaze upon have collapsed in on themselves—they are ours now, to guide, to give light. My finger has traced the roads on the rough palm of your hand, has memorized the topography of calluses and every whorl of its fingertips. 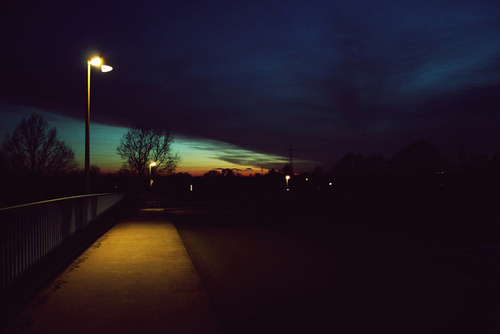 Still, I remain lost on this sidewalk, under this streetlight where you and I shared a kiss. I’m scared of the future, but really, who isn’t?